Why didn't I love these books more. . . . For one thing, they felt padded to me, with pages of poetic musings about roasting chestnuts and growing potatoes and the history of blackberries and I just wasn't riveted enough to soldier through. This is a matter of personal taste. I like stories and I like recipes, but these are more like reveries and I found myself skimming them. Pages and pages of them. As to the recipes, there was something overly casual about them. I wrote about this while I was cooking through the books, but I'll repeat it here: I felt that Slater cobbled together some of these recipes in his kitchen with a blob of marmalade and a knob of butter and a few gnarly apples on a drizzly Sunday afternoon. Of course, this is part of Slater's charm. He doesn't write glossy, show-offy recipes; his are frumpy, unpretentious "make do" recipes. Eccentric great aunt recipes. Hobbit recipes. I'm thinking specifically of countless monochromatic unfrosted 1-layer cakes made with fruit, wholemeal flour, and brown sugar. And marmalade. I made a lot of Slater's cakes. Brown and flattish and very tasty, they all run together in my mind. While I don't need glossy, show-offy recipes, I don't really need recipes like Slater's at this point in my cooking life. I've already got plenty of recipes for cakes that taste like muffins. What I'm looking for are stand-out recipes. I'm sounding harsher than I actually feel. I liked more of the dishes than I disliked and for all my carping, these are overall very solid cookbooks. If you own them, keep them. If you don't own them, well, check them out of the library for a test run before you commit. 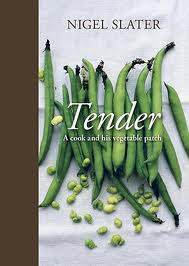 From Tender, volume I (the vegetable book) I made 18 recipes. From Tender, volume II, I made 9 recipes. The two best dishes I made both came from Tender, volume 1 and they are: the pumpkin scone, which I served with sharp cheese and which was unlike anything I'd ever eaten before, a memorable and brilliant use of boring squash. And Slater's oxtail stew is the best I've ever made. Still. Shelf essential? In my opinion, no. I will comment from now on about your cookbook reviews. I love them. I am of an age and have accumulated way too many cookbooks I don't use. I just boxed up a lot to take to the local library. I still love cookbooks, but earnestly try to discipline myself not to buy them. Your reviews help with that. I, too, want standout recipes, recipes that inspire me to cook and eat them with great relish. Thanks for the pointers!